Has anybody purchase Leaf springs from General Springs KC , or Spring Works? They are not as expensive as Eaton Detroit Springs. 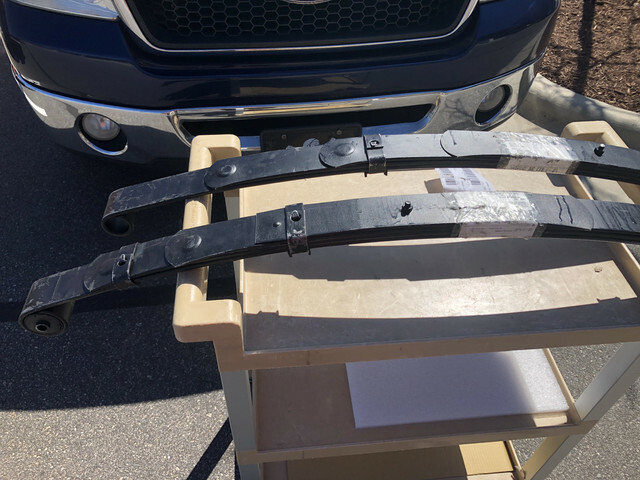 I am looking to replace my tired old 73 hardtop leaf springs. Here they have 4 listings for the 67-73 mustangs >> $89.99 each. 1967-1973 Ford Mustang Rear Leaf Spring - Competition Handling > $125.70 each. I'd go with the 42-547 springs, which is what I have in my current 71 Mach and have used in several others. Mustangs Unlimited has them for $110 with free shipping. I emailed their customer service with this message. I have a 1973 Mustang Hardtop with A/C, 302 V8, and AOD transmission. It has the standard 4 leaf springs. 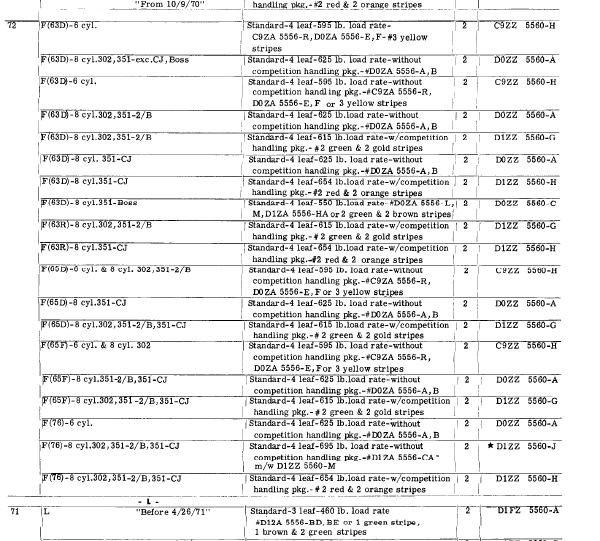 I am looking to replace the OEM original springs. I was looking @ Eaton Detroit until I found General Spring KC. I am looking at the 1967 - 1973 Ford Mustang rear leaf spring, improved handling, 4 leaf. My only concern is the Spring Capacity = 655. Typically, the competition spring load rate is 615 Lbs. Would it affect the ride? There was a lot of different springs built for those Mustangs. If you go for the competition handling it’ll have a higher spring rate but not going to be terrible and destroy your ride. If you’re really getting on it then I’d go with something higher performance such as the improved handling. If you’re just cruising around then I’d go with the standard replacements. I used general spring for my 65 F100 and was pleased with the quality. 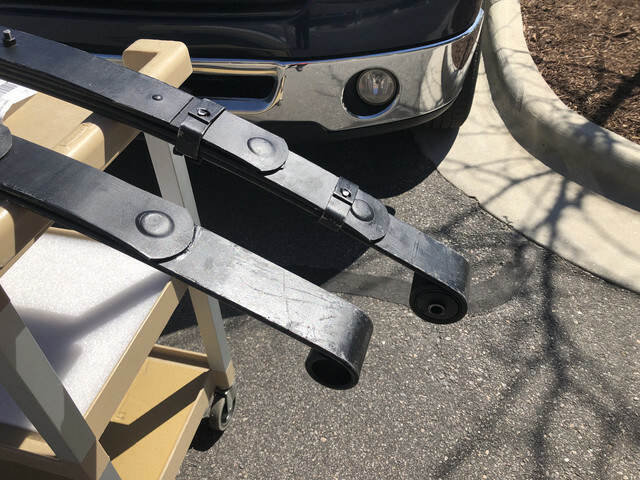 (03-25-2019, 01:33 PM)Canted 393 Wrote: I used general spring for my 65 F100 and was pleased with the quality. Good to hear about real world user. Thanks for the input! Look forward to installing. Keep you posted with pictures! 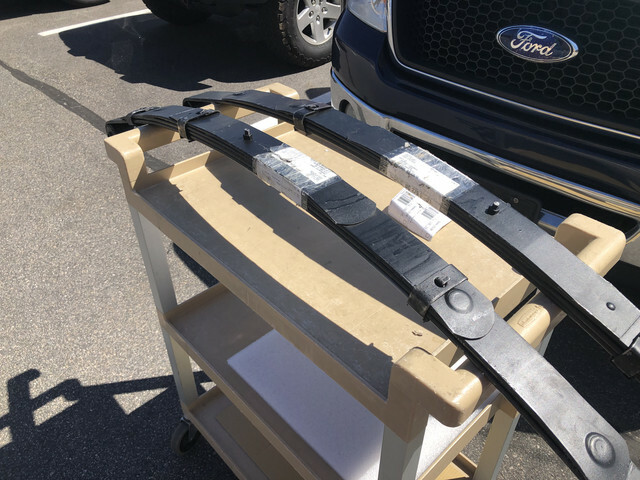 Received the Leaf springs from General Spring KC. Look good and are heavy! Ya! Look to next weekend for install. Often wonder why Eaton Detroit is more expensive! Yes! I noticed that. Maybe Ford made it a bit lighter? Spring rate is not load rate. spring rate is how many pounds to deflect the spring one inch. Load rate is how much weight is required for the spring to be at it's designed ride height. The Boss 302/351 springs were 155 lb/in spring rate, the regular CS springs were 138 lb/in. It makes sense the load rate would be lower, as the springs would be built with less arch due to the higher spring rate, and the Boss cars were less likely to be loaded with 4 people and a weeks worth of luggage. The '69 B302 used the same rear leafs as the Shelbys. The 71 B351 and 70 B302 used the same rear leafs.